While her audience's visceral enjoyment is important to Dee, her personal mission is to enhance their experience by introducing new dance music produced around the globe. Early on, this desire to play new and better music led Dee to the field of music production. As her skills sharpened, so did her notoriety. Dee's mixes have reached into the Top 20 of Billboard's Hot Dance Club Play Chart many times, including her own track, Twisted Dee's "Drop That Beat" and Lisa Hunt's "Joint is Jumpin'" which was featured in an episode of Queer as Folk. Dee's mixes have also appeared in videos on the Logo channel, and her mix of Ari Gold's Wave of You received Logo Channel's “Sexiest Video of the Year” award in 2006. Dee's productions have also been played by headlining DJ's including Abel, Tony Moran, Offer Nissim, Junior Vasquez, Paulo and Manny Lehman, just to name a few. Dee's love of her art includes an active interest in and commitment to her fellow DJs and music producers. To help promote both new and established producers get their product out to the public with the proper recognition and financial rewards, Twisted Dee started her own music label, Hammer Music USA. In its infancy, Hammer nonetheless includes an impressive list of producers including Deep Influence, FC Nond, Alyson Calagna, Solar Sun, Jose Spinnin, Dario Gomez, Jose Velez, with others ready to join the ranks of Hammer. Hailing from Long Island, New York, Dee began her career first in her father's night club and then in other local clubs. 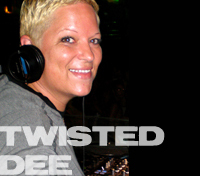 As her personal and professional identity developed, Dee began playing to audiences throughout Long Island and New York City as well as on Fire Island, initially at several clubs in Cherry Grove and later and currently in the Fire Island Pines, where she is the resident DJ and has earned the distinction “Best DJ on Fire Island” for several years running. When not on her home turf, Dee travels extensively playing in Canada, Brazil, and Mexico on a regular basis. Over the past few years, Dee has been featured in major circuit events including Winter Party Miami, NYC Pride, Rio and Sao Paulo Gay Prides, Carnival and New Years Eve in Rio de Janeiro, and Bal En Blanc Montreal. Dee was recently named ‘Resident DJ’ for R:EVOLUTION PARTY, the largest gay independent promotion in Rio and Sao Paulo, Brazil. 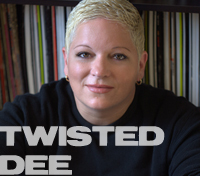 Labeled the “DJ's DJ”, Twisted Dee is admired by her peers and fans alike. Promoters who have worked with Dee praise her professionalism, talent, approachability, and passion to always please her crowd. Dee now resides outside of Orlando Florida, where she focuses her time exclusively on making music & touching as many people as possible through her live performances and production work.